A dental implant is essentially a substitute for a tooth's natural root and is commonly screw or cylinder shaped. Dental implants are usually made of titanium, a metal that is well-tolerated by the body. Over time, the jawbone becomes firmly united with the implant. A small attachment at the top of the dental implant emerges through the gum. 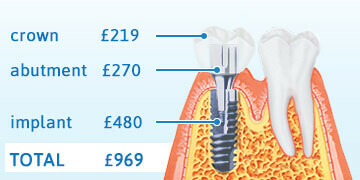 Crowns, bridges or dentures can then be attached to the implant by screws or clips. In some cases (but not every) before implantation sinus lift and bone substitution need to be performed. A dental implant is essentially a substitute for a natural root and commonly it is screw or cylinder shaped. Dental implants are usually made of titanium, a metal that is well-tolerated by the body. Over time, the jawbone becomes firmly united with the implant. A small attachment at the top of the implant emerges through the gum. Crowns, bridges or dentures can then be attached to the implant by screws or clips. IMPORTANT: „Implant” means root replacement (located inside the jawbone) without any „teeth” (prosthetic devices i.e. crowns/bridge/denture) on top of them. VitalEurope's implantologists perform implant surgery as an outpatient under local anesthesia, oral conscious sedation or nitrous oxide sedation. 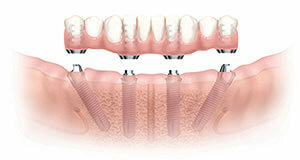 There are several dental implant systems that our doctors use. Alpha-Bio implants entered the market 20 years ago and developed a long list of innovative products designed to provide dentists with the most comprehensive and efficient array of solutions. They are manufactured in Israel. Nobel Biocare Replace implants are well known Nobel Biocare products made in Sweden. Nobel Biocare has been dedicated to solving tooth problems for over 40 years and is a world leader in aesthetic dentistry. Straumann implants give dentists the freedom to choose the solution they want to deliver. While increasingly popular, implants are not appropriate for everyone. You need to be medically fit and have healthy gums and a sufficient thickness of jawbone. Your dentist will assess the amount of bone still there. If there is not enough, or if it isn’t healthy enough, it may not be possible to place implants without grafting bone into the area first. I am totally toothless. Is there a solution for me? In case you have no teeth at all and you are looking for the best solution to restore your smile here is an infomative chart that shows you different methods of replacing missing teeth. Whether you opt for dentures, implant-retained dentures or implant with crowns here you will find the best alternatives that fit your needs and budget. The chart also gives you a guidance on costs and treatment length. From the time of implant placement to the time of placing the first teeth, treatment times can vary between 2 weeks and 6 months. Your dentist will be able to give you a personalized timetable before the treatment begins. Stage 1: Placing the dental implants The procedure itself takes 10-15 minutes/implant. The dentist exposes the bone in the jaw where the tooth is missing, then he drills a hole and inserts the implant into the bone. This is usually done under local anesthesia but other means of sedation can be used at extra cost. The gum is then stitched and it is left to heal while the bone grows around the implant, making it secure. A temporary healing abutment is often placed on the implant to allow the gum tissues to heal. If the treatment is carried out in Budapest you can leave the day after the operation. Stage 2: Stitches removal The stitches are removed approximately a week later. Stage 3: Implant exposure After a 20-week healing period a small cut is made in the gum and a healing abutment is placed on top of the implant. The healing abutment is a screw that helps the gum form perfectly before placing the final solution. Stage 4: Final fitting The dentist takes an impression and the laboratory starts preparing the final solution. Following several tries, provided the dentist and the patient are both satisfied the final solution will be fitted on the abutments. This stage requires a 5-10-work-day-visit in Budapest or several shorter visits in London. As technology evolves in more and more cases the final solution can be fitted on the implants immediately after the intervention. Will I be toothless between sessions? Between operations you will not be left toothless but will be fitted with temporary teeth. What else can be placed on dental implants? If you have no teeth in the lower jaw, and are not yet ready for multiple implant placements, a conventional lower denture can be considerably improved with two dental implants placed beneath the front section - this is called an ‘overdenture’ or retained denture. The same overdenture concept when used to treat the upper jaw, will usually require more dental implants as the bone is generally softer. Implant-supported overdentures, just like conventional dentures are still removed for daily cleaning, however, once back in the mouth, the dental implants make them much more stable. Following surgery, there will probably be bleeding, controlled by biting down on some gauze. Swelling may be controlled using an ice pack. Gums are generally sore after the surgery for 7 – 10 days. Antibiotics and painkillers will be provided. You will be able to drink but eating might be difficult for 24 hours after the procedure. To help maintain your dental implants you need to thoroughly brush and floss regularly. Your dentist will give you specific advice on caring for your dental implants. He or she will ask you to attend regular check-ups. If a tooth has been broken, or weakened by a lot of decay or a large filling, a crown can be fitted. Your dentist will match the crown’s shape and color to your other teeth so it will look natural. The crown will last for many years, depending on the health of the tooth underneath. A temporary crown is put over the tooth until the permanent crown is prepared. A bridge consists of crowns which are permanently fixed to healthy supporting teeth. It is used to replace missing teeth, restoring appearance and function. A bridge can be made of either porcelain, porcelain fused to metal, or Procera®. When preparing a conventional bridge, the dentist needs to shape the teeth either side of the gap so that they will successfully hold the bridge.A typical bridge is illustrated below. The natural teeth either side of the space have been prepared to have crowns fitted. These crowns are permanently fused to an artificial tooth in the centre. The process of fitting crowns and bridges requires two visits. If it is done in Budapest either two short visits of 3+2 working days or a single visit of 5-7 working days. During the first session our dentist takes X-rays to assess the health of your mouth. In case of crowns the tooth receiving the crown is trimmed. In case of bridges the supporting teeth are trimmed. Preparation involves recontouring these teeth by removing a portion of enamel to allow room for a crown to be placed over them. A shade guide is used to select the correct colour of porcelain. Impressions are taken of the prepared teeth and the teeth of the opposite jaw. A temporary bridge or crown may be bonded to protect the prepared teeth between visits (you must also avoid hard or sticky food and keep the temporary bridge or crown clean). During the second session: the temporary bridge or crown is removed. The permanent crown or bridge is checked for colour and fit. If you and your dentist are happy with your crown or bridge, it is permanently fixed in place with dental glue. While a crowned tooth does not require any special care, you should continue to follow good oral hygiene practices, including brushing your teeth at least twice a day and flossing once a day - especially around the crown area where the gum meets the tooth. Porcelain-fused-to-metal dental crowns and bridges are colour matched to your neighboring teeth. Next to all-ceramic crowns, porcelain-fused-to-metal crowns look most like natural teeth. However, sometimes the metal underlying the crown's porcelain can show through as a dark line, especially at the gum line and even more so if your gums recede. These crowns can be a good choice for front or back teeth. In case of front teeth the dentist can use aesthetic shoulder porcelain to cover the mentioned dark line, this way they can achieve a far better aesthetic result. Procera System® is a unique system for manufacturing aesthetic and functional dental restorations. A CAD/CAM technology ensures optimal fit, great strength, non-porosity and it has the ability to transmit light. Unlike other ceramic crowns, Procera® can be recommended for prosthetic reconstructions anywhere in the mouth, due to the strength of the core material. It is made of a bio-compatible material, which minimizes the risk of allergic reactions. The translucent coping offers remarkable aesthetic characteristics, recreating the beauty of natural teeth. Procera Emax pressed ceramic crowns are far stronger than the traditional porcelain or Procera® crowns and resist chipping or cracking which means they will look better for longer. If we normally expect a porcelain crown to last for many many years, with care and regular check-ups an Emax crowns should last double that. The thin layers of pressed ceramic mean that Emax crowns have a high translucency and are less noticeable due to its true-to-nature shade behaviour. It is durable and provide lifelike esthetics, irrespective of the shade of the preparation. Emax is recommended mainly for single crowns, both for front and back teeth. Emax can be fitted on implants and its preparation time is the same as traditional ceramic crowns. A partial denture can be used to replace one or more missing teeth. This type of denture must be removed for cleaning and should be taken out at night. There are a variety of types, but they usually include a metal and/or plastic base that carries plastic artificial teeth. Metal clips are usually used to keep the denture in position. Where possible, these are hidden so that they cannot be seen while smiling and talking. Full dentures are needed when there are no teeth left in the upper or lower jaw. Full dentures must be removed for cleaning and should be taken out at night. They are usually made of a plastic base that carries plastic teeth. Full upper dentures cover the roof of the mouth. A very thin layer of saliva between the roof of the mouth and the denture creates suction, which keeps it firmly in position. Because upper dentures cover the palate it may affect how people sense temperature and taste of food. Full lower dentures can be more difficult to keep in place. This is partly because the floor of the mouth is very muscular, and may push the denture out of place. However, over time the tongue muscles tend to get used to the shape of the denture and adapt to keep it in place. Is it difficult to get used to dentures? It is very important to have realistic expectations of dentures. They should help you eat, speak and smile confidently, but even the best dentures won't feel the same as natural teeth. After having new dentures fitted, it's normal to produce more saliva than usual for a few hours, and for your mouth to feel a bit irritated for a few days. During the first days and weeks, your tongue and cheek muscles will adapt to the new dentures. At first, some words may be difficult to pronounce. Reading out loud and practicing tricky words can help. It takes a while to get used to eating with new dentures, so it's best to start with soft food. Chewing slowly, using both sides of the mouth at once, will help to keep the denture in place. The older you are, the longer it can take to get used to new dentures, especially if you haven't worn false teeth before. Like natural teeth, dentures must be kept as clean as possible. They should be cleaned twice a day, and rinsed after eating. Any remaining natural teeth should be brushed twice daily. Take the dentures out and clean them over a folded towel or basin of water - they are fragile and likely to break if dropped. Use a soft toothbrush and toothpaste to remove any food that has stuck to the dentures. When you aren't wearing your dentures, keep them in a container so that they don't get broken. At night, put them in clean water or a denture-soaking solution. Ask your dentist to recommend a solution that is suitable for your design of dentures. Never soak them in bleach or boiling water. Worn, ill-fitting dentures can cause irritation and discomfort. Ideally, dentures should be replaced once in a while before problems arise. People with full dentures still need to see the dentist regularly. 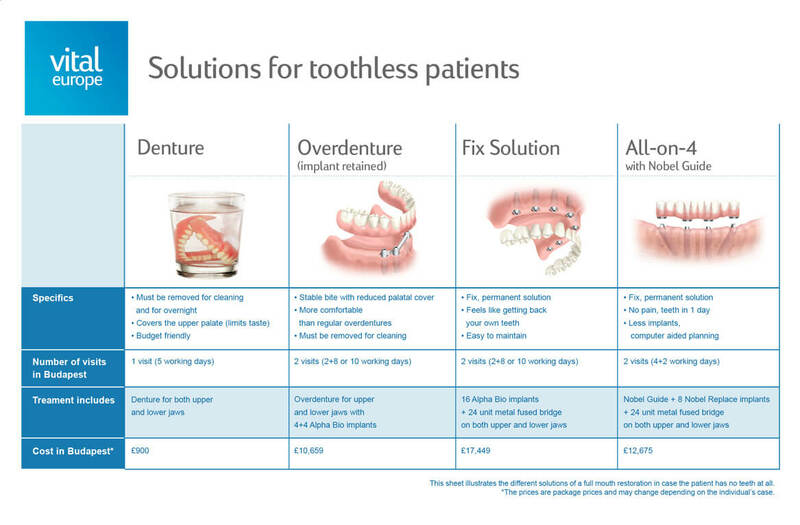 What alternatives are there to dentures? An alternative treatment for toothless patients are dental implants. For patients who still have natural teeth remaining, other forms of treatment might include implants or bridges or both. The All-on-4™ procedure uses four dental implants to create a fixed (non-removable), natural looking teeth in just one visit! 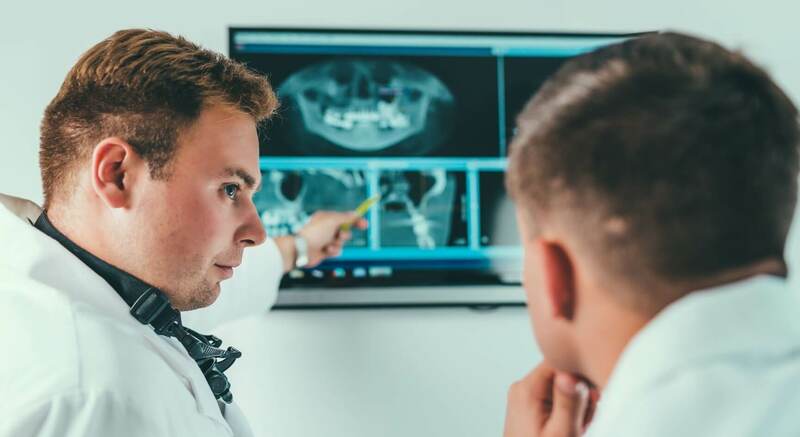 Placing a titanium implant in the jaw is a quick, minimally invasive procedure that provides a strong foundation for replacement teeth and helps stabilize bone levels-keeping the jaw healthy. This method can also be applied to patients who lack bone mass, so even those patients with virtually no bone can have a secure a full upper and/or lower set of teeth. Why is All-on-4™ a good option? Is All-on-4™ right for me? During your initial consultation you will meet our dentist in a relaxed atmosphere and have ample time to discuss treatment alternatives, times and costs. In every case you will receive one or more detailed treatment plans so that you can make travel arrangements, take time off work, and budget accordingly. Depending on your case you will be offered the All-on-4™ method as an alternative if possible. Placing a dental implant is a quick, minimally invasive procedure. This procedure is performed with a 3D planning tool called Smart-Giude to locate the exact place and depth of the implants. To facilitate the procedure and ensure quality, replacement teeth are manufactured at our on-site lab and inserted the same day. Once you finish treatment you will leave with your new teeth and immediately be able to eat, speak and smile with confidence. SMART Guide is a high-end digital solution for your dentist to perform the perfect plan and positioning of your implant. The dentist plans your case digitally on the computer in a relaxed environment. SMART Guide is applied for the All-on-4™ treatment. Your dentist informs you about the details of the treatment. Modern diagnostics - The treatment starts with high quality 3D imaging. Minimizing the risks - The unwished risks and complications of free-hand implantation can be reduced with precise planning and its accurate realization. Shorter surgical time - Due to the advanced preparations and the patient specific surgical guide the chair-time can be reduced to a fraction. Less pain and inconvenience - Guided surgery gives the possibility for a treatment as minimal invasive as possible. In many of the cases it means no sutures and less pain. No additional procedures - With seeing and using most of the given anatomy, expensive and risky procedures can be avoided in most of the cases. What is a dental CT and why is it important? The first in the UK, the ORTHOPHOS SL 3D is an innovative imaging technology. Sirona is a trusted global brand made with distinguished German quality that we use at our London clinic. With lowest radiation and award winning design it creates several thousands of incredibly sharp pictures in one rotation. Be it overlaid teeth, unexpected nerve channel paths, concealded roots, or temporomandibular joint anomalies, the 3D imaging significantly increases our diagnostic accuracy. The revolutionary DCS sensor provides never-before-seen image sharpness. Radiopaque objects, such as metals may cause metal artifacts but MARS software automatically recognizes and reduces these objects, supporting the dentist in precision planning. This device has a comfortable and secure patient positioning for perfect images where we can customzie the optimal position of our patients. As a result the screening is efficient, time-saving thus our patients can look forward to perfect results with fewer treatment sessions.